BroadWave Technologies has developed a new line of power dividers for applications across all wireless bands. Model 151-173-002 is a 2 way, 50 Ohm, DC-6 GHz, 1 Watt unit with SMA female connectors. 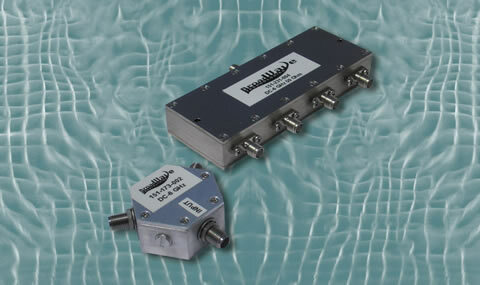 Insertion loss is +/- 0.5 dB maximum DC-4 GHz and +/- 0.8 dB maximum 4-6 GHz with maximum VSWR 1.50:1. Model 151-231-004 is a 4 way, 50 Ohm, DC-6 GHz, 5 Watt unit with SMA female connectors. Insertion loss is +/- 1.0 dB nominal with maximum VSWR 1.50:1. These devices are ideal for dividing signals for in-building wireless, WiFi, WiMAX and Homeland Security / Public Safety systems. Weather resistant units, other configurations and connector types are also available. Please contact us with your unique requirement for the appropriate model number.